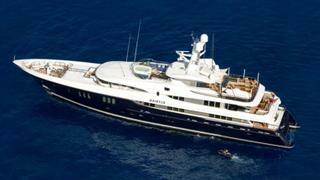 The 60 metre motor yacht Elysian has been listed for sale by Burgess. Built in steel and aluminium by German yard Abeking & Rasmussen to a design by Donald Starkey Designs, Elysian was delivered in 2009 and will now attend the Monaco Yacht Show. Her opulent and contemporary Bannenberg & Rowell-designed interior accommodates 12 guests across six cabins, including a full beam master suite on the main deck, which comes complete with an owner’s office, walk-around king bed, his and her's ensuite with a Jacuzzi tub and separate steam shower, private head and twin sinks. The entire master suite also features 12 large oval windows that let in ample natural light. Four additional guest cabins aboard this yacht for sale, comprising two king size and two queen size beds, sit on the lower deck while the sixth cabin, offering two Pullman berths, is located on the bridge deck. Powered by twin 3754.00hp CAT 3516-B engines, Elysian has a top speed of 16 knots and cruising speed of 14 knots. On display at the Monaco Yacht Show, Elysian is asking €47,500,000.